Simply put, acupuncture is the insertion of fine filiform sterile single use needles into acupuncture points on the body. These acupuncture points are situated on meridians which integrate the energetics of the body into a whole. When there is stagnation or lack of flow in the energetic meridians, disease and pathology arise. Regulating the meridians and creating free flow through the use of needles creates the space and potential for innate healing to take place. ﻿Acupuncture ﻿is a form of healing that dates back more than 3000 years with its golden period in the Han dynasty (206bc – 220ad). It was in this golden period that the foundational Chinese medical texts were written (Su wen, Ling Shu, Nan Jing). These texts form the basis of Chinese Medicine and acupuncture concepts still to this day, and the many differing styles of acupuncture all draw their roots from these foundational texts. Over 3000 years acupuncture has travelled from China to Japan to Korea and to the rest of the world always adapting to its environment and social conditions. These adaptations and interpretations have created the many different schools of thought and styles of acupuncture available today. These styles or schools include but are not limited to: Saam acupuncture which was developed in Korea with a 400 year history. Kiiko Matsumoto style which is a complete system with influences from Manaka, Nagano, and Kawai. Worsley five element acupuncture based on J.R Worsley’s interpretation and adaptation of five element philosophy which he brought back to the west in the md 1950’s. To the mainstream Traditional Chinese Medicine (TCM) that took shape in the last sixty years and was brought to the forefront by Chairman Mao’s Great Leap Forward (1958 – 1961). Other mainstream styles include Toyohari which was originally taught to blind Japanese practitioners with the Toyo Hari Medical Association founded by Kodo Fukushima in 1959, and other meridian therapy styles which developed in the 1940’s in reaction to the modernising trend in acupuncture taking place in Japan, with their cry for the direction of acupuncture to return to its classical roots. It is important to note that all these styles of acupuncture are equally valid in the hands of the right practitioner, however they do vary in their levels of interpretation and adherence to the classical acupuncture concepts. As well as varying in the treatment techniques that they employ, and the size/ gauge of the needles that they use. What this means to those seeking acupuncture treatment is that your practitioner may adhere to one style or another and subsequently use thicker/ or thinner needles, use non penetrative needles, press on the body more, not press on the body at all, take your pulse or look at your tongue, ask a variety of weird and wonderful questions or none at all. My recommendation for those receiving treatment is to always critically evaluate its effect and that you are benefiting from the acupuncture session. We as acupuncturists are ultimately here to assist you in regulating the body/mind and to subsequently take away pain in its many forms. PCOS (polycystic ovary syndrome) is a diagnosis I have seen many women present with in the acupuncture clinic. It is important to note that although as the name suggests, polycystic ovaries are not the cause, but rather one of the symptoms. The cause of this syndrome is not known, however the dynamics and interactions are multifactorial and there is not one definitive test that can identify the causative factor for the disharmony. Due to its syndrome nature, diagnosis is made on certain criteria (Rotterdam) to be met. It is truly a multi-system disorder that can be classified as a gynaecological condition, a metabolic disorder, endocrine disorder, genetic disorder, or a combination of the above as the signs and symptoms show within the boundaries of all these specializations. Although I am an Acupuncturist, I feel it is important to present information in a language people are more familiar with, thus for the purpose of this discussion I am presenting in more of a western medical language. Furthermore, those who have been diagnosed with the syndrome have most likely already hit the internet to learn more about the condition. Regardless what ‘language’ I use, I would like to emphasize that in diagnosis and treatment I use the meridians, acupuncture points, and reflective area palpation that is always guided by Acupuncture philosophy and concepts. To gain a general perspective of polycystic ovary syndrome it is important to view the hypothalamic pituitary gonadal axis in its physiological (balanced) state, as well as in its pathological (imbalanced) state, and the associated systemic effects in both cases. Under the influence of gonadotropin releasing hormone (GnRH) which pulses from the hypothalamus, the Anterior Pituitary secretes each month certain levels of Follicle Stimulating Hormone (FSH) and Luteinizing Hormone (LH). These hormones travel via the blood stream and act on the ovaries, specifically causing the expansion and growth of the primordial follicles within the ovaries. These follicles (within the ovaries) then begin to secrete estrogen, which travels in the blood stream to reach the anterior pituitary gland. This feedback signals the pituitary to release a surge of luteinizing hormone (LH) which impacts the ovaries and causes the most mature follicle to burst and release its oocyte. The oocyte finds its way to the fallopian tube where it awaits fertilization, and naturally if the egg is not fertilised it will be shed along with the lining of the uterus (endometrium) upon menstruation. The remaining follicles that did not reach their pinnacle of maturation and subsequently release their oocyte, dissolve. The follicle remnant that did burst and release the oocyte becomes the corpus luteum which produces progesterone, and continues to shrink until it dissolves. Again under the influence of the Gonadotropin Releasing Hormone (GnRH) which pulses from the hypothalamus, the anterior pituitary is directed to release FSH and LH, however in this case excessive amounts of Luteinizing Hormone (LH) are released. This results in the disruption of the normal menstrual cycle and the follicles do not reach the maturity required for ovulation to take place, thus resulting in anovulation or oligoovulation. Furthermore, a proportion of the follicles do not dissolve and therefore remain as fluid filled sacs or cysts. Additionally the pancreas is stimulated to secrete more insulin into the blood stream, which when coupled with high levels of LH, instigates the ovaries to produce high levels of testosterone which unfortunately further prevents ovulation. This brief explanation of the hypothalamic pituitary gonadal axis in relations to PCOS highlights why the pathology is seen to affect so many systems in the body and furthermore why the symptoms of the syndrome present as they do. Now let’s look at the diagnostic criteria I alluded to earlier, that when met, constitutes a diagnosis of PCOS. This criteria is known as the Rotterdam Criteria, which states that 2 of the 3 symptoms must be met to reach a diagnosis of PCOS. Now if we look at some of the symptoms experienced in the syndrome and relate it to the hypothalamic pituitary gonadal axis described above, we can gain some insight into some possible mechanisms that relate to why these symptoms appear. Fertility issues: can occur but some women with a PCOS diagnosis conceive just fine. If infertility is an issue it would possibly relate to the disrupted menstrual cycle and anovulation. Excess androgen activity: increased testosterone may show as (hirsutism) the male hair patterns some women experience. This relates to the high insulin levels coupled with the LH surge effecting the ovaries to excessively produce testosterone. Polycystic Ovaries: Due to a proportion of the follicles not dissolving as in normal physiology, they give the appearance of Poly=many Cystic=fluid filled sac. Which are not really cysts but rather follicles. Insulin resistance: As the beta cells of the pancreas are stimulated to produce excessive amounts of insulin, over time this can inhibit the effectiveness of insulin in lowering blood sugar. Acne: again this can be due to increased testosterone levels. The contraceptive pill: to regulate the menstrual cycle and decrease testosterone production. Anti-androgen meds: to assist with the presentation of the hair growth and acne. Metformin: A medication administered to type 2 diabetics. Firstly, I would like to state that the label of PCOS does not mean that much to me in regards to a diagnosis. One reason is that the symptomatic criteria for the diagnosis changes over the years as well as the accepted criteria model itself. In other words, depending on the model used for the diagnosis the same woman may be given the diagnosis for PCOS or may not be given the diagnosis at all. However I always take into account the western medical diagnosis, and I like to have somewhat of an understanding of the pathophysiology. As this is another tool that I can use to bring me closer to understanding what is holding this individual back from being in a state of balance and optimal health. Here I will give a brief insight into how I view the presentation of Polycystic Ovary Syndrome, as well as concepts that I focus on when treating an individual diagnosed with this condition. As with everyone that I treat I have them fill out a detailed medical history form which greatly assists me in understanding the constitution of the individual. Through palpation of the meridians and reflective areas I am able to assess the body and the constitutional concepts that may be out of balance. Thus the coupling of these two diagnostic tools greatly assists in the direction of treatment and concepts addressed, and as a result will differ from person to person, as no one has the exact same medical history or the exact same meridians and reflective areas reactive. This highlights the individualised nature of treatment through acupuncture for the same ‘label’. However for the purpose of this discussion in a generalised sense I focus on the menstrual cycle in great detail from menarche to now, medications taken in the past to present, and emotional health. The state and balance of the menstrual cycle is of paramount importance for every woman and not just for women with PCOS, it is highly reflective of the state of a woman’s health and I believe it is a systemic glimpse of what is occurring within the organism. For its smooth occurrence the neuro-endocrine system needs to be functioning well, and what influences the neuro-endocrine system? Or is influenced by the neuro-endocrine system? Basically everything from psyche to soma, hence its importance. Therefore my intention is in regulating cycle length, menstruation duration and quality, pain experienced (physical or emotional). All of these parameters are of the upmost importance, and the beautiful thing is that we can effectively gauge the treatments effect by the release of pressure pain on reflective areas/meridians and by the state of the menstrual cycle when it occurs. Key meridians I focus on may be for example the Liver meridian or Kidney meridian. Reason being is that the ovaries like the majority of the glands fall into the domain of the Kidneys in Chinese medical philosophy, and the Uterus falls into the domain of the Liver. I cross check these theories on the table by seeing whether points on the Liver and Kidney channels best release the pressure pain I find on reflective areas through palpation. A woman has presented to the acupuncture clinic with a main complaint of infertility which she is told by her GP is due to her diagnosis of Polycystic ovary syndrome and subsequent anovulation. Upon palpation I find many reflective areas with pressure pain, one of which is the stomach meridian in the region of the acupuncture point Shuidao. This reflective region, to me, relates to the ovaries and the subsequent pressure pain may relate to an ovarian imbalance. Thus I want to release this pressure pain, the acupuncture point I find that does the best job in this case is Fuliu on the kidney meridian. Theoretically Fuliu is one of the principle tonification points for kidney deficiency and thus is the metal point on the water channel, and as I stated the ovaries in Chinese Medicine fall into the concept of the Kidney. Therefore I tested the ‘theory’ through palpation and her body gave me the answer through the immediate release of pressure pain. This concept of testing ‘theory’ directly on the body through palpation is the essence of the style of acupuncture I employ, and it provides a benchmark during the treatment process. This coupled in this case with the parameter of the menstrual cycle occurring in a regular manner, is ideal to gauge the effectiveness of treatment, and thus the ultimate goal in this case being, conception. In regards to other key areas I would focus on if the need was confirmed via palpation would be: Down regulation of the nervous system i.e. releasing the sternocleidomastoid and any subsequent compression of the vagus nerve, releasing the Ren Mai to assist with emotional balance, addressing a weak dan tien, resolving Ren 9 pulse, releasing pressure pain on any of the pituitary reflective areas or associated meridians, releasing Kid 2 & Liv 2 p. pain, addressing any thyroid imbalance, Liver and Pancreas imbalance, or any related structural imbalance/meridian imbalance. If we induce a state through acupuncture whereby a woman’s menstrual cycle can occur naturally, regularly, without pain or discomfort, without emotional upset, and the menstrual flow to be neither too heavy nor too light, we have regulation on a systemic scale. As we know the menstrual cycle is a reflective culmination of all the systems in the body working in a state of balance and harmony or imbalance and dysfunction. Not to mention it is a direct manifestation of the individuals connection to the heavens (lunar cycle), thus further compounding its importance and relevance. As an acupuncturist I find that the majority of those seeking treatment present with neck pain to a certain degree. It may not be the primary reason that they have come for treatment, however due to lifestyle factors such as stress, repressed emotions, poor sleep, poor posture, trauma, and lack of balanced movement, many individuals experience tightness and discomfort in the neck region. I believe that the neck region is one of the most important areas to address in treatment, the reason for this is that it serves as the bridge between the brain and the body. What the mind wills, the body does, and this relationship is linked via the neck region. From an anatomical perspective the neck contains cranial nerves that innervate organs and regulate homeostatic balance, carotid arteries and jugular veins, as well as glands which play a pivotal role in exocrine/endocrine roles in metabolism and homeostasis. From an acupuncture perspective many important meridians pass through this region, including the stomach meridian, large intestine meridian, gall bladder meridian, and san jiao meridian. As well as acupuncture points that relate to the heavenly points, or window of the sky points, ‘wind’ points, and key reflective areas that relate to the constitutional energetics for the individual. Thus for these reasons it is of paramount importance that the neck region remains relaxed, balanced, and pain free. In the acupuncture clinic, as always, I first address the constitution of the individual. Carefully palpating the abdomen (hara) I look for tightness or pressure pain in key reflective areas that relate to the state of the organs and meridians. Palpation of the meridians and neck is included in the diagnostic process, and tight or painful areas are noted. This palpatory technique is pivotal in gaining insight into the individuals’ constitutional state and as to what is holding the individual back from being in a state of optimal health. I would like to note that the majority of the time, addressing the constitution will benefit the symptoms i.e. neck pain, that have brought the individual to treatment. However for the purpose of this page I will highlight areas I would address when dealing with the symptom of neck pain, as well as describe the importance of why these areas need to be resolved if they present with tightness or pressure pain. As I stated previously the neck is the link between the brain/mind and the body thus when dealing with neck pain, key areas that I palpate include the scalene muscles, sternocleidomastoid, trapezius, splenius capitus region, and cervical vertebral region. If we look at these areas from an acupuncture/anatomical perspective we can see that pressure pain and tightness in these regions can impact the whole organism and not just cause pain in the local region. Scalene muscles: Can often become tight and painful contributing to neck pain and restricted range of motion. Furthermore as the scalenes originate from the cervical vertebrae and attach to the first and second ribs, tightness can also result in drawing the first rib upwards, compressing the neurovascular bundle against the clavicle, and thus resulting in thoracic outlet signs and symptoms. Furthermore this region is where the acupuncture point Quepen lies, and it is at this acupuncture point that the stomach, large intestine, small intestine, sanjiao, and gall bladder channels meet at. Thus tightness and pressure pain at this region can relate to a range of meridian pathologies manifesting in a multitude of signs/symptoms. Sternocleidomastoid muscle (SCM): The SCM can become tight due to emotional repression, physical trauma i.e. car accident, or just poor posture. Regardless, tightness and pressure pain is commonly seen in the acupuncture clinic unilaterally or bilaterally. It is extremely important to release this area from pressure pain as it can cause neck pain and restricted range of motion, as well as for the fact that the vagus nerve passes through this region. Thus a tight SCM can impinge and obstruct the vagus nerve (parasympathetic nerve) and thus impact on many aspects from mood, digestion, respiration, and much more. Furthermore, the anterior border of the SCM belly is the region of acupuncture point Renying, which translates to ‘Mans Welcome’ and is a key diagnostic area for thyroid imbalance (based on the Kiiko Matsumoto system). Thus these aspects further highlight the importance of releasing the SCM in cases of neck pain, and in any case where tightness and pressure pain is found by palpation, as the above shows, a tight SCM can impact far more than just the neck region. Trapezius Muscle: The trapezius muscle especially the upper fibres play a pivotal role in treating neck pain/restricted range of movement, as they are involved in extending the head and neck, as well as unilaterally contracting to laterally flex the head to the same side, and rotate the head and neck to the opposite side. Key acupuncture points I palpate for pressure pain and thus focus on releasing with distal acupuncture points incude: The region of Tianzhu (window of heaven point), Fengchi (‘wind’ point), and Jianjing. I want to stress that when pressure pain is found on reflective areas/acupuncture points like these, I do not needle them directly, but rather use distal points ( i.e. on the arms and legs) to release these areas. Releasing these areas of the trapezius muscle greatly benefits the neck and shoulders and is integral in treating neck pain. Cervical vertebrae: I find in the clinic that palpating the whole posterior region of the neck, observing tightness/pressure pain on the cervical spine (du mai), region of the cervical intertransversarii (cervical huatuo region), and splenius capitus region (bladder meridian) and releasing these areas through distal acupuncture points, to be extremely beneficial in addressing neck pain or discomfort. Above I have highlighted some key areas/meridians that I find very important in diagnosing, assessing, and addressing in regards to treating neck pain. Furthermore my intention is to convey that releasing the neck region from tightness and pressure pain through the regulation of the meridians is much more than the structural beneficial effect induced, but rather a systemic regulation that can be far reaching from body to mind. It is very interesting to note that the classic Chinese Medical text, the Ling shu (Spiritual Pivot) which came to be in the Han dynasty (206BC – 220AD), also highlighted the importance of the neck and the acu-points in this region. It is in scroll one, chapter two that Qi Bo (the emperor’s physician) describes the shu transport/antique points situated from the hands/feet to the elbows/knees. The importance of these acupuncture points is still known today and these are the main acupuncture points used by many acupuncturists in the modern day clinical setting. Once Qi Bo has described the shu points and trajectory he goes on to mention the ren mai being between Quepen (St 12), he then describes the points in the neck region which western acupuncturists know as 'window of the sky points'. Discussing these 'neck' points in the same chapter entitled "Roots of acupuncture points" and describing them in the same breath as the shu transporting points, further illustrates the importance of the neck region and the acupuncture points in this region. The purpose of this page is to present and discuss a range of information, thoughts, and ideas relating to the thyroid gland and associated pathologies that may manifest through its dysfunction. Through this analysis we will gain an understanding of the pivotal role the thyroid plays in maintaining homeostasis, as well as the many systemic factors that both influence and are affected by the thyroids state of balance/imbalance. We will also discuss the role Acupuncture plays in regulating the individual and subsequently ameliorating the symptoms that are associated with dysfunction of the Hypothalamic-Pituitary-Thyroid Axis (HPTA). Due to there being quite a few concepts to introduce and discuss on this multifactorial topic, I will attempt to give structure to this page by addressing the more gross anatomical concepts first, followed by basic physiological cellular interactions, pathological disharmonies and how they manifest and effect within the body, as well as interspersing commentaries on how acupuncture plays a role in assessing and addressing these dynamics throughout the text. If we look at the thyroid gland it basically resembles a butterfly shape with two lobes joined by an isthmus. In regards to its location if we work from the hyoid bone and travel inferiorly we will come to the larynx, and further down we descend to the trachea, the thyroid gland lies between the larynx and trachea. In other words the thyroid gland is in the neck region and lies below the Adams apple (thyroid cartilage). Blood supply occurs via branches from the aorta in the form of the superior and inferior thyroid arteries. It is important to not that when the thyroid gland is in a state of balance it is difficult to palpate (feel), however when in a state of dysfunction resulting in inflammation/fibrosis it is possible to feel the gland. Furthermore the fascia and muscular structures/tissues surrounding the thyroid become sensitive to touch and can be spastic/tight due to the effect of the inflammatory process. Therefore, as an acupuncturist this region is of great diagnostic importance and the intention for treatment is to release the pressure pain/tightness found on this diagnostic reflective area for the thyroid gland. This is done through palpation and the use of distal acupuncture points (acupuncture points on the arm and legs) which relate to the individuals constitutional state, (i.e. in the case of kidney deficiency tonifying the correct acupuncture point/s on the foot shaoyin channel should subsequently release the thyroid region). In my experience addressing reflective areas/symptoms through the constitution is of paramount importance for the success of treatment. So, we have discussed the basic structure and location of the thyroid gland, now let’s look at what it does, what instigates its actions, hormones involved, and what these hormones do systemically. Understanding these concepts in a state of physiology will greatly assist us in understanding why people experience the signs and symptoms they do when the thyroid is not functioning optimally, as well as why the medications they are taking may not be relieving their experienced symptoms. Furthermore, it gives a conceptual reference point to discuss the effects that acupuncture can induce resulting in bringing the body back to this point, being the individuals’ physiological state. In order to comprehend thyroid function we need to begin with the hypothalamus, which is located below the thalamus and above the brain stem. You can imagine the hypothalamus as a relay centre that acts as a major link between the nervous system and the endocrine system. It is here at this neuro-endocrine link that thyroid releasing hormone (TRH) is released and travels to the anterior pituitary, causing the anterior pituitary to release thyroid stimulating hormone (TSH). Now TSH travels to the thyroid gland, which is comprised of multiple epithelial cell follicles with a colloid as its centre. This colloid is encapsulated by the epithelial cell ring which constitutes a thyroid follicular cell, and this cell is the functional unit of the thyroid gland. Furthermore, imagine that these follicular cells gather together in groups or aggregations of anywhere from 20 to 40, these groups are referred to as lobules. Now if we isolate one of these thyroid follicular cells we observe that under the influence of thyroid stimulating hormone (TSH) secreted by the anterior pituitary, the thyroid follicular cell will begin to secrete and produce thyroid hormones, namely T3 (triiodothyronine) & T4 (thyroxine). It is these thyroid hormones that upon reaching their target cell/tissue have the function of raising the metabolic rate or amount of energy expended. Let’s look at the general mechanism as to how T3 & T4 are produced in the follicular cell. First the main constituents needed are iodine and the amino-acid tyrosine. It is through the capillary that feeds the follicular cell that iodide is able to enter the follicular cell membrane. It does this through a ‘pump’ that allows the entry of sodium and iodide and the exit of potassium. Now we have iodide in the cell we need to get it into the colloid as this is where the synthesis of thyroid hormone takes place. Once in the colloid the enzyme peroxidase coverts the negatively charged iodide to the useable iodine. Tyrosine that was present in the colloid in the form of thyroglobulin undergoes further chemical processes and binds with iodine, finally resulting in the lipid thyroid hormones T3 & T4. I have included this simplified mechanism to highlight the importance of iodine in the production of thyroid hormone. Endemic goitre (thyromegaly) is a result of not having adequate amounts of iodine in one’s diet. As we can see above not enough dietary iodine can result in inadequate amounts of thyroid hormone being produced, and subsequently hypothyroid signs and symptoms. I would like to stress this is not an issue in Australia these days, as we are not dependant on a local food base (higher iodine levels in soil) and the majority of salt is iodised. However it certainly does relate to populations that are dependent on a local based food source where the regions soil is poor in iodine. It is interesting to note that the thyroid follicle produces more T4 than T3, however the more active hormone is actually T3. What this means is let’s say the thyroid follicle has produced T3 and more T4, they are lipid hormones so they need to travel with a protein carrier (i.e. albumin) through the blood stream to reach their target cell (i.e. cardiac cell). It is at the cardiac cell that the abundant T4 is converted to the highly active T3, which enter the cardiac cell with ease (lipid hormone/phospholipid cell bi-layer) to initiate the thyroid hormone response. Which in this case as we know thyroid hormone raises the metabolic rate may manifest as increasing heart rate and cardiac output. Furthermore, let’s say that there is enough T3 & T4 circulating in the blood to meet the demands of homeostasis (balance). We don’t want too much synthesized and secreted by the thyroid otherwise we will have symptoms of hyperthyroidism, (i.e. anxiety, weight loss, brittle hair, tachycardia, diarrhoea…). Thankfully there is a negative feedback mechanism in place that is triggered by too much circulating thyroid hormone which will inhibit the hypothalamus in secreting thyroid releasing hormone (TRH). This halts the pituitaries production of thyroid stimulating hormone (TSH), and ultimately less T3 & T4 produced by the thyroid. Before we go on to look at pathophysiology (imbalance) of the thyroid gland I would like to clarify some key points we have mentioned above. The thyroid hormones T3 & T4 have the main function to increase basal metabolic rate (BMR), basically this means increase the rate of chemical reactions and thus increase the use of oxygen and glucose inside the targeted cell. Thyroid hormone does this on a cellular level by increasing the number of sodium potassium ATPase pumps present in the cell, and these 'pumps' are what utilise about 70% of the energy in our BMR. Thus the more 'pumps' we have the greater the cellular workload and associated output. Note that this can occur in skeletal muscle (causing growth), the heart (causing increased heart rate & cardiac output), liver, kidneys, among other tissues. Therefore the thyroid function and thyroid hormone effect the body systemically and engages many organs and tissues. Now that we have established an understanding of thyroid function in its balanced state we can more easily grasp the concept of dysfunction, and how acupuncture can assist to regulate the individual and relieve the associated symptoms. Below I will address hyperthyroid function as seen in Graves ’ disease, as well as hypothyroid function as seen in Hashimoto’s thyroiditis. Furthermore I will address and discuss why many individuals can show normal blood lab results, yet experience very real thyroid related signs and symptoms, and how acupuncture can help. I would like to note that in regards to aetiology, the thyroid gland and associated functions can reach a state of imbalance due to a myriad/combination of reasons. Some of these include stress, lack of oxygen, various medications, weight loss pills (i.e. using synthroid for this purpose only), some birth control pills, lithium, immune issues, liver issues/failure (poor conversion of T4 to T3), and hormonal issues. Thus it is possible that regulating/removing these aspects from one's life (when possible), can resolve the issue completely. Signs and symptoms can relate to thinning of the hair, enlargement of the thyroid gland (due to autoimmune response/inflammation/fibrosis), increased heart rate and cardiac output, hyperreflexia, diarrhoea (due to increased gut motility/peristalsis), heat intolerance/sweaty (due to increased exothermic response), susceptibility to pretibial oedema, exophthalmos (bulging eyes due to autoimmune response), associated weight loss (due to increased basal metabolic rate), and possibly anxiety. Here you can see that hyperthyroidism and increased production of T3 &T4 affect a range of tissues and basically increase the cellular metabolic rate, resulting in the above signs and symptoms. If we observe a common instigator of hyperthyroidism being Graves’ disease we need to understand that this is an autoimmune condition. What this means is that the body is not recognising self from non-self, and is ‘attacking’ its own tissues thinking that they are foreign invaders. In Graves’ disease what occurs is an immunoglobulin (i.e. key) that looks very similar in structure to thyroid stimulating hormone (TSH) that as we discussed, is released by the anterior pituitary, binds to the TSH receptor (i.e. lock) which is on the thyroid follicular cell of the thyroid gland. Once this ‘key’ opens the ‘lock’, an auto-immune response is triggered and the associated inflammation and destruction to the thyroid gland occurs. What also simultaneously occurs in Graves’ disease is the ‘key’ & ‘lock’ combination initiates increased iodide intake into the thyroid follicle and this increases the production of thyroid hormone, as well as increasing the release of thyroid hormone into the blood and thus increasing basal metabolic rate. This mechanism of action is why in Graves’ disease you get both the destruction/inflammation of the thyroid tissue, as well as the increased amount of thyroid hormone synthesis and release, manifesting in hyperthyroid signs and symptoms. The associated exophthalmos (bulging) eyes that is indicative of Graves’ disease is due to the immunoglobulin also attacking the fatty tissue at the orbital socket, and thus resulting in inflammation behind the eyes, causing the eyeball to exhibit this ‘bulging’ look. From an acupuncture perspective (based on Kiiko Matsumoto Clinical Strategies) it is integral for the success of treatment to address and regulate the immune system (due to the autoimmune component). There are key diagnostic palpatory areas on the body that reflect the state of the immune system, and effecting a change in these reflective areas through the correct acupuncture points and the associated release of tightness and pressure pain is the objective on the treatment table. When dealing with hyperthyroidism it is of paramount importance to treat the constitution of the individual. Thus I observe and palpate key diagnostic areas on the body (meridian & reflective areas) that indicate the state of the individual's constitution. Key indicative areas that I focus on, include the reflection of the thyroid gland, pituitary, adrenal gland, kidney meridian (as it dominates the glands), liver (excess/deficiency or both), autonomic nervous system, pericardium meridian, and Ren mai. The reason it is important to treat the complete individual and address imbalances through acupuncture in this manner is because, as we have established imbalance of the thyroid can involve or effect the pituitary, hypothalamus, immune system, heart, skeletal muscle, liver, kidney, and much more. In contrary to the above, hypothyroidism is a low functioning of the thyroid gland and this can be categorised into three main categories: primary-acquired (i.e. Hashimoto’s & endemic goitre), primary-congenital (i.e. genetic abnormalities in thyroid tissue), secondary (i.e. due to pituitary issues). If we view the signs and symptoms relating to a low functioning thyroid gland we see it exhibits brittle hair, periorbital oedema, facial swelling, constipation (due to decreased peristalsis), slow heart rate and cardiac output, cold intolerance (due to decreased exothermic response), associated with weight gain and depression. A common cause of low functioning thyroid is Hashimoto’s thyroiditis, which falls into the category of primary-acquired. This condition much like Graves’ disease, is an autoimmune condition however it differs in that the immunoglobulins bind to the TSH receptors and destroy the thyroid follicles. This results in the destruction of thyroid tissue with the associated inflammatory response, as well as the low thyroid hormone levels and associated hypothyroid signs and symptoms. Again, it is important to note that these immunoglobulins do not just target the thyroid gland but can also damage tissue in the gut, brain, and heart. This is one of the reasons why individuals on synthetic thyroid hormone medications may show with better blood results, but still feel unwell. Yes, the amount of T3 and T4 circulating may be better due to the synthetic thyroxine taken, but how are they functioning once they reach the target cell, and is the conversion process of T4 to T3 occurring optimally? Not to mention that destruction due to the autoimmune reaction is still taking place, regardless of blood levels (TSH, T3 & T4). I am definitely not saying that blood tests are not needed, nor medication, all I am saying is that 'good' blood results are not the final benchmark in assessing whether the condition is under control. There needs also to be an amelioration of the individual's signs and symptoms to conclude that treatment is efficacious. This concept of the person being in a state of balance and wellness is of paramount importance in the acupuncture clinic. There is no point for me to diagnose an individual, treat them based on what I find in their medical history & palpation, yet their symptoms stay the same and I tell them that they are now well. Just the same as an individual who goes for blood tests which show they have high TSH with low T3 & T4, take their meds and as a result have better blood lab results yet still have the same symptoms, be told that now they are well. It is common in the acupuncture clinic to find individuals who exhibit signs and symptoms of low/high functioning thyroid yet have blood results in the normal range. These people respond very well to constitutional acupuncture treatments, just as individuals who are diagnosed with low/high thyroid function and take medication yet still have the associated symptoms. The beauty of acupuncture is its ability to assist in regulating the body and thus its processes. As I have stated throughout this page, a thyroid dysfunction is not just a problem with the thyroid and its associated hormones, it is of a systemic ‘whole’ nature. Individuals with the ‘label’ will know that their mood/stress state plays a massive role in their other associated signs and symptoms, or shifts in their diet translate to their ‘thyroid’ signs and symptoms. This is due to the body being an interconnected whole that is inter-dependant to varying degrees on all else that constitutes the ‘whole’. To highlight this interconnectedness I would like to share with you some ideas on the aetiology of thyroid imbalances that I have come across in my reading and tested in my own clinical practice, some of these thoughts are systematised in Kiiko Matsumoto’s Clinical Strategies. It is proposed that in Japan the thyroid gland is seen as one of the major ‘shock’ absorbers in the body. Prolonged stressful events, trauma, or perceived trauma, can impact the thyroid gland causing dysfunction as well as impact on the adrenal gland. From a Classical Chinese perspective the kidney meridians internal pathway passes and relates to these glands, and in my own clinical experience it is acu-points on this meridian that play an integral role in treatment of individuals presenting with these imbalances. Furthermore, I have seen individuals that present with thyroid imbalances improve dramatically with utilising treatment strategies that are directed at balancing the immune system & autonomic nervous system, when this is what medical history and palpation dictates is a constitutional imbalance for them. It is through acupuncture that we subtly allow the space for the organism to regulate itself. Through the use of medical history, palpation and improvement in the individuals signs and symptoms we are able to effectively gauge the effect of treatment. As an acupuncturist the intention is always to create an environment that is conducive to the individuals’ optimal state of health inherent to them. Sinusitis is an extremely common condition that the vast majority of people will experience at some point in their lifetime. Generally acute sinusitis relates to a new infection that lasts up to 4 weeks, whilst chronic sinusitis relates to symptoms that do not dissipate before 12 weeks. Acupuncture not only provides effective symptomatic relief for acute sinusitis but can also get to the root cause that is allowing the chronic sinus infection to linger or reoccur. To your right I have included an image of the sinuses so we can see the frontal, ethmoidal, and maxillary sinuses. Now that we understand the structures that we are dealing with it is important to note that sinusitis can be due to infection (viral/bacterial), allergic hypersensitivity, or an autoimmune response. The most common reason for sinusitis is generally a viral infection, however in the three scenarios mentioned (infection, allergy, autoimmune) the common thread is an impaired immune system. Granted if an individual experiences one bout of sinusitis in their life and recovers from it quickly with no lingering effects, their immune system is clearly not impaired. However in my experience in treating sinusitis with acupuncture the individuals who seek treatment generally have repeated bouts with lingering effects. The state of the immune system plays an integral role in all three of the possible causes of sinusitis. If it is due to an infection we need to ask ourselves why the immune system is not operating efficiently in its response to the pathogen. If repeated bouts are occurring why is 'healing' not taking place, and why are the internal conditions conducive to harbouring the pathogen and the subsequent opportunistic viral/bacterial attack. Let’s say that the sinusitis is due to an allergic hypersensitivity, why is the immune system recognising an inert/harmless substance as a threat and thus initiating an inflammatory response. Again if the presenting sinusitis is due to an autoimmune component, why is the body not recognising self from non-self and in effect destroying its own tissue. All the above highlight an imbalanced immune system that is in need of regulating, and I find when addressing sinusitis in the acupuncture clinic the best long-term results come from working on the acupuncture meridians that relate to the sinuses, but more importantly addressing any immune system imbalances present through constitutional acupuncture treatment strategies. If we take a look at the meridians that due to their trajectory relate to the sinuses and subsequently when treated can provide relief from the associated signs and symptoms, we find the gallbladder meridian, stomach meridian, and urinary bladder meridian. These meridians engage the frontal and maxillary sinuses and it is the acu-points that are on these meridians that I utilise for both diagnosis and treatment. An example of this is last week I treated an individual with chronic recurring sinus infections amongst other health complaints. As I diagnose and treat through palpation I palpated the region of the maxillary sinuses (Sibai ST 2 region) which were sensitive to the touch. Finding the correct acupuncture point that in this case was Master Nagano’s metal/water acupuncture points (Neiting ST 44 & Lidui ST 45) released the pressure pain at the maxillary sinus by 75%. Similar acupuncture treatment strategies were carried out on the gallbladder and urinary bladder meridian which further decreased the pressure pain elicited on palpation of the maxillary sinus region as well as increasing his ability to breathe through his nose. This meridian treatment strategy is highly effective and is taken from master acupuncturist Kiyoshi Nagano as presented in Kiiko Matsumoto’s Clinical Strategies. As I mentioned previously long lasting results in my experience require more than just relieving the inflammation of the mucosa membrane, thus acupuncture treatment needs to address the imbalanced immune system. Thus my treatment strategy includes addressing the immune reflective areas that show tightness or pressure pain on palpation. These areas include the ‘wind’ and lymphatic region in the neck as well as the right side of the navel (as in the Nanjing the right side of the naval reflects the Lung). The subsequent release of pressure pain/tightness of these reflective regions as well as the release of all constitutional related pressure pain/tightness leads to a more effective long-lasting acupuncture treatment. Another important and simple form of therapy that I recommend to those suffering from sinusitis is nasopharyngeal rinsing. You can use a neti pot or a pipette, which ever you prefer, however it is important to use warm water that is a minimum of 37 degrees (body temperature), and to use enough sea salt to create a hypertonic solution (i.e. sea water taste not saline). Daily rinsing with this hypertonic salty solution is a great way to gently flush the sinuses of debris as well as draw out water and thus inflammation from the sinus mucosal membranes. Please do not use any of these high pressured cold sprays, the reason I say this is that cold high pressurised liquids/vapour/or anything should not go up your nose, and it is counterintuitive to say the least. The purpose of this article is to give a basic overview of diabetes mellitus from both a western scientific and acupuncture perspective. We will address the basic pathophysiology that results in diabetes signs and symptoms, as well as relate this pathology to a classical acupuncture framework and subsequently highlight the role acupuncture can play. So, what is diabetes mellitus? Diabetes mellitus ‘honey urine’ is a metabolic disorder that basically disrupts the body’s ability to utilise glucose to produce energy. How this disruption occurs is either through an autoimmune component that leads to the destruction of the insulin secreting beta cells of the islets of Langerhans within the pancreas as in type 1 diabetes, or via cellular insulin resistance occurring generally due to poor lifestyle choices and a subsequent increase in circulating fatty acids, as in type 2 diabetes. Let's take a look at type 1 and type 2 diabetes more closely to really get a feel for what is occurring and what are the mechanisms at play. Essentially what occurs in type 1 diabetes is that the immune system attacks and destroys the insulin producing beta cells of the pancreas. Thus the body is not able to produce insulin. How this occurs is debatable, however there is research that shows a link to molecular mimicry whereby a virus that carries a similar protein receptor to that of the beta cells of the pancreas enters the body and initiates an immune response, this results in the destruction of the virus but also an autoimmune reaction and subsequent destruction of the pancreatic beta cells. Thus type 1 diabetes is defined as loss of insulin production. In type 2 diabetes the insulin producing beta cells of the pancreas are fine and the endocrine role of the pancreas in secreting insulin is operating as it should be. The issue is with the target cells receptivity to insulin. The current theory as to why the target cell is not receptive to insulin and thus failing to initiate the appropriate cascade resulting in the cellular uptake of glucose is due to high levels of circulating fatty acids. These high fatty acid levels initiate a chemical response that inhibits the ability for insulin to ‘allow the passage’ of glucose into the target cell. If you imagine insulin as the ‘key’ that opens the target cell ‘door’ so glucose can enter and be converted into a useable form of energy (ATP). Thus type 2 diabetes can be defined as insulin resistance. It is important to note that type 2 diabetes can shift to type 1 diabetes. If you imagine that in type 2 diabetes the pancreas is producing plenty of insulin in response to rising blood glucose levels (i.e. fed state). However as the cells of the body are not responding to the circulating insulin, the circulating glucose cannot gain entry into its target cell (i.e. muscle cell). Thus blood glucose levels remain high (hyperglycaemia), this in turn tricks the pancreas into thinking that it needs to produce even more insulin (hyperinsulinaemia). Over time this over production and overwork of the pancreas results in destruction of the insulin producing beta cells of the pancreas, and thus results in type 2 (insulin resistant) diabetes shifting into type 1 (loss of insulin production) diabetes. Acupuncture can play a very important role in treating the individual, however before we discuss this it is of paramount importance to mention the role of diet and lifestyle. As we have established briefly above, type 2 diabetes which accounts for around 90% of cases is seen to be initiated by circulating fatty acids. Thus it is no surprise that the work of Dr Neal Barnard shows that countless individuals have been able to ameliorate there condition by following a low fat high plant based diet. This contrasts to the outdated belief that a low carbohydrate diet should be followed. Exercise, stretching and breathing exercises have been shown to regulate endocrine and metabolic function and can assist in the down regulation of the autonomic nervous system. Furthermore due to the strong link of obesity to type 2 diabetes these activities combined with good eating habits can prove extremely beneficial in reducing excess body weight. In regards to acupuncture's role in the treatment of diabetes it can provide a regulatory function in terms of the immune system. As well as provide various treatment strategies to balance endocrine and hormonal function. If we relate classical Chinese medical philosophy to a condition like diabetes mellitus we can see that they attributed to the earth element the responsibility of transporting and transforming food to a useable form of energy for the whole body. This sounds very similar to the endocrine role of the pancreas in its secretion of insulin and the resulting cellular uptake of glucose that is then transformed into a useable form (adenosine triphosphate). Thus strengthening the function of the earth element can play a pivotal role in the amelioration of diabetes signs and symptoms. In regards to my clinical practice key meridians I focus on when addressing individuals who present with diabetes symptoms include the kidney meridian, spleen meridian, as well as addressing the constitution of the individual accordingly based on palpatory findings. Acupuncture stems from a philosophy of treating the individual, thus I can honestly say that although I do use specific treatment strategies for dealing with diabetes symptoms, treatment will always be guided by palpatory findings related to the constitution of the individual and subsequently the treatment acupuncture points used will vary from person to person. Diet, exercise, and regulating the immune system and endocrine function are essential when dealing with diabetes symptoms, and acupuncture can play a pivotal role in the harmonizing of the individual and greatly improve their health and vitality. As always if you have any questions please feel free to contact me. Acupuncture is a form of therapy that lends itself beautifully to regulating and ameliorating individuals who may be suffering from disorders such as amenorrhea (no period), dysmenorrhea (painful), menorrhagia (heavy/prolonged), to metrorrhagia (irregular). I believe that in order to have an understanding of pathology (imbalance) it is important to comprehend the concept of physiology (balance), thus this page on menstrual function and disorders is dedicated to presenting and relating processes and concepts that relate to menstruation from both a biological perspective as well as from a classical acupuncture perspective. As we as a society are more familiar with biological terminology I have introduced some fundamental acupuncture concepts in relation to biological processes with the intention of highlighting how acupuncture can regulate the body on a truly deep & systemic level. When we observe the menstrual cycle it is important to understand that it involves much more than the ovaries and uterus. Menstruation is dependent on the hypothalamic-pituitary-ovarian axis which is the hypothalamic pituitary gonadal axis (HPG) as seen in females. As I have stated before in previous articles and blogs the neuro-endocrine system is a complex interrelated system that receives input from and acts on every bodily function and thought. Thus it is for this reason that menstruation and the balanced state of the menstrual cycle is of paramount importance. As stated this neuro-endocrine link is highlighted by the hypothalamus which resembles a 'switchboard' that receives input from other regions of the brain and nervous system and subsequently in menstruation it is the hypothalamus that receives the message to secrete gonadotropin releasing hormone (GnRH). GnRH travels via the portal blood to the anterior pituitary lobe causing the pituitary to release Follicle stimulating hormone (FSH) and Luteinising Hormone (LH). These two hormones (LH & FSH) secreted by the anterior pituitary gland act primarily on the ovaries and essentially regulate the three phases of the menstrual cycle. These three phases are categorised as the Follicular phase, Ovulation, and the Luteal Phase. If we observe the above graph we can see that the 'x axis' denotes a woman’s cycle that lasts for 28 days, of course individual duration of a woman’s menstrual cycle can vary greatly, however for the purpose of this explanation 28 days is the cycle duration. On the 'y axis' we have what is occurring in the ovaries, body temperature, anterior pituitary hormone release, ovarian hormone release, and the uterus (endometrial lining) in relations to the proposed 28 day cycle. 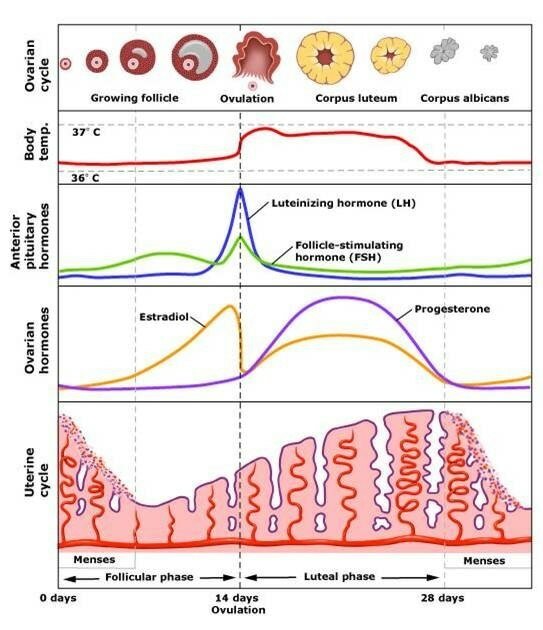 You can observe that the graph shows day 0-14 as the follicular phase leading up to ovulation at day 14 and days 14-28 as the luteal phase. It is important to note that Day 1 of a women’s menstrual cycle is considered to be the first day of menstruation. Keeping the above in mind lets observe what is occurring during the menstrual cycle from day 1. So as stated Day 1 of the menstrual cycle is the first day of the menstrual bleed. Thus the lining (endometrium) of the uterus is shed as fertilisation of the egg (ovum) did not take place. Generally speaking the menstrual bleed can last for two to seven days depending. Now at this point in time the ovaries are receiving via the pituitary gland Follicle Stimulating Hormone (FSH), which has the main function of stimulating the growth of the ovarian follicles which contain the oocyte (immature egg). You can see on the graph above that FSH rises from Day 0 to around Day 8 and this has the desired effect of causing growth and maturation of the ovarian follicle, as well as causing the follicle to secrete Oestrogen (estradiol in the graph). Thus as the ovarian follicle grows under the effect of FSH, it begins to increasingly secrete oestrogen. Oestrogen is the hormone that is responsible for stimulating in females muscle and bone growth, as well as endometrial growth to some extent, and maintains the female secondary characteristics (related to kidney energetic concept in acupuncture). Furthermore at relatively low concentrations as seen in Day 0 to around Day 8 oestrogen inhibits the secretion of Luteinising Hormone (LH), and this is why on the graph you can see low levels of LH from Day 0 to Day 12. However this all Changes around Day 12 to 14, as the maturing ovarian follicle is getting pretty big by now and thus is secreting much higher amounts of oestrogen which in turn causes the anterior pituitary to release a surge of Luteinising Hormone (LH). Interesting to note that as stated relative low concentrations of oestrogen inhibits Luteinising Hormone, yet higher concentration of oestrogen stimulates LH. This surge of Luteinising Hormone results in the most mature ovarian follicle to rupture and release its oocyte (egg) in a process called ovulation (Day 14). This point of ovulation brings us out of the follicular phase of the menstrual cycle and into the ovulatory phase. The oocyte (egg) is release from the ovary and is ushered into the fallopian (uterine) tube by the finger like projections (fimbriae) where the egg will await fertilisation to occur. After ovulation we enter the Luteal phase (Day 14-28) where here we observe that the surge of Luteinising Hormone (LH) has come and gone, and we are left with relatively steady levels of FSH and LH. However what you will note on the graph above is that progesterone levels have increased dramatically from around day 15 to 25 and this correlates with the rise in basal body temperature/basal metabolic rate (by-product of increased progesterone levels/ovulation) as well as the transition of the ruptured ovarian follicle that released the oocyte to the corpus luteum. Thus it is the corpus luteum that under the influence of Luteinising Hormone secretes and is responsible for the high progesterone levels. Interesting to note that the corpus luteum also secretes a hormone called inhibin which inhibits the anterior pituitary from further secreting Follicle stimulating hormone. Now the main effects of progesterone as secreted by the corpus luteum, is to increase blood vessel growth (vascularisation) in the endometrium and subsequently thicken the endometrial lining. The reason for this is to prepare for the possibility that our previously released oocyte (egg) meets a sperm in the fallopian tube and form an embryo which will eventually find its way and embed itself into the vascularised (thanks to progesterone) endometrial lining. Now if no fertilisation takes place the corpus luteum further degrades into the corpus albican and ultimately disintegrates resulting in progesterone and inhibin levels to drop, thus initiating a new menstrual cycle to begin marked by the shedding of the endometrial tissue as menstrual blood. In regards to understanding menstrual disorders it is important to understand that there is an interrelated chain of command (that is highlighted above) which results in menstruation. This ‘chain of command’ is the hypothalamus as the neuro-endocrine link initiating the pituitary to secrete hormones which act on the ovaries and cause the secretion of ovarian hormones which results in uterine changes. Thus, hypothalamus to pituitary to ovaries to uterus. Now this is a simplistic linear view, however it opens up a world of possibilities and brings me to my point that the hypothalamus in the brain receives input from a multitude of sources from the emotions to much more, and this is how the delicate balance of the menstrual cycle can be shifted off centre for so many (psyche to somatic) reasons. Thus the menstrual cycle and its associated state of balance is of paramount importance and is dependent on the individual’s state of ‘constitutional’ health. Fortunately acupuncture is an amazing form of therapy that is 'regulatory' in its very essence, thus it can beautifully align the individual on a systemic scale and subsequently can ameliorate menstrual disorders very effectively. Whether the pathological presentation be no menstruation (amenorrhea), heavy and prolonged menstrual flow (menorrhagia), frequent yet irregular menstruation (metrorrhagia), or painful menstruation (dysmenorrhea). It is essential in treatment through acupuncture to establish via palpation and medical history what may be preventing the individual from having a natural, pain free & rhythmic menstruation. Taking into account medications, surgeries, diet, other medical issues, and ultimately palpatory findings a treatment plan is formulated and actively tested on the body through the subsequent amelioration of pressure pain on the associated reflective areas and meridians, as well as diligent record taking in regards to improvements and shifts in the menstrual cycle itself & associated symptoms. This acupuncture treatment approach encompassing immediate shifts on the treatment table coupled with record keeping cycle to cycle allows for accurate benchmarking in regards to treatment progress and further aids in the ‘whole’ regulatory process taking place. Now if we look at the menstrual cycle from a classical acupuncture perspective we see that in the Suwen (basic questions) an acupuncture text that was written more than 2000 years ago contains a chapter titled “The Universal Truth”. In this chapter among other concepts it discusses the reproductive physiology of women following a seven year cycle. The paragraph begins by stating that a woman’s ‘kidney energy’ becomes full at the age of seven and thus the permanent teeth arrive, at the age of fourteen her fertility essence (heavenly waters) mature and menstruation occurs (menarche), the paragraph continues illustrating the following seven year increments up to the age of forty nine where it states the fertility essence ‘dries up’ and she is no longer able to conceive (menopause). Now if we observe this pivotal chapter of the Suwen we can see that the energetics of the kidneys which the classical Chinese related with growth, development, reproduction & maturation are mentioned as the foundation of the reproductive cycle. This function that the classical Chinese acupuncturists attributed to the kidney energetics strongly reflects the biological role attributed to the hypothalamic pituitary ovarian axis in particularly oestrogen’s role in bone growth and development (female secondary characteristics). Furthermore the pulsation of gonadotropin releasing hormone (GnRH) from the hypothalamus (brain) affecting the pituitary and ovaries can be related to the heavenly waters the classical Chinese acupuncturists associated with menstruation as it is the ‘heavens’ (brain) that descends its virtue to the ‘earth’ (body) that initiates ‘Qi’ (function). Thus when treating menstrual disorders with acupuncture, key meridians I work on include the Kidney meridian, for the reasons we have presented above and many more. As well as the Spleen meridian, as the classical Chinese acupuncturists stated that the energetics of the spleen control the blood and dominate the first stages of its formation, as well as ‘holding’ the blood and preventing pathological haemorrhaging. Again, we should not get caught up in the label of ‘spleen’ or 'kidney & liver' as it is the attributed function that is important. We know the spleen is composed primarily of lymphatic tissue, however interestingly the spleen does have a haemopoietic function and is involved in the creation of red blood cells as well as lymphocyte production. Furthermore when we relate this concept of the ‘spleen’ energetics to menstruation and menstrual disorders it relates strongly to the proliferation and growth of the endometrial lining (possibly impeded in amenorrhea presentations), subsequent vascularisation (blood vessel growth), as well as the ability to ‘hold’ the blood and prevent pathological haemorrhaging (i.e. menorrhagia). Thus it is no surprise that when dealing with menstrual disorders from amenorrhea to menorrhagia the spleen meridian is always incorporated in my acupuncture practice. It is interesting to note that the energetic concept of the Liver encompasses among other functions the contractility of muscles. Keeping this in mind I find that treating the liver meridian can be extremely beneficial in ameliorating menstrual and uterine disorders. Reason being is that although it is the spleen's energetics that have been attributed to the endometrial lining (uterus lining) it is the myometrium (muscular wall) of the uterus and its associated contractility that relates to the energetics of the Liver. Thus in cases of cramps & dysmenorrhea (painful cycle) I find regulating the contractility of the myometrium through the classical acupuncture concept of the liver to be extremely beneficial in ameliorating the individual and thus the condition. Above I have highlighted some basic acupuncture treatment concepts I use when treating individuals with menstrual disorders, however I use a range of treatment strategies that are guided by what presents on palpation and subsequently what the reflective areas and meridians dictate. As I have stated time and time again I believe the state of a woman's menstrual cycle to be of paramount importance and I have provided all the information above to highlight the multi-system processes and dynamics that can be regulated if a woman's menstrual cycle is brought into a state of balance and harmony. Regardless of the diagnosis/label given it is my goal by treating the individual through acupuncture to assist in creating an environment where a woman's menstrual cycle is regular, timely in flow, and without associated pain or emotional upset. As always, if you have any questions or would like to make a booking feel free to contact me. A 62 year old female presented to my practice with a main complaint of lower back pain. The pain has been present on and off for the last two years. Previous cortisone injections have provided little relief with said minimal relief lasting for only a few weeks. Other notable patient history details include long term use of medications including beta blockers and diuretics for hypertension, statins for hyperlipidemia, and SSRI's for depression. Upon palpation patient showed pressure pain at the centre of the sacrum and the lateral bladder meridian region at sacrum region. Dai Mai region was painful at left side and inguinal ligament at left side. Abdomen revealed slight Oketsu, strong immune, bi-lateral adrenal and tight GB 21 region bi-lateral. Treatment began by releasing Oketsu with Liv-4 & Li-11 bi-laterally. Kidney meridian treatment included Kidney 9 & 7 left side with Kidney 9 right side and Kid 27 bi-lateral. This released the left sided pressure pain at Dai Mai region and the inguinal ligament as well as the adrenal reflective zone at Kid 16. SP-9 and SP-6 were needled bi-laterally with the addition of under the third toe for regulation of blood pressure and the subsequent release of the GB-21 pressure pain. Once all the needles were in I re-palpated the reflection zones mentioned above and found significant release at all regions except for the immune reflection zone (right ST-26 to 27) region (Lung region - Nan Jing). I proceeded to add okyu moxibustion at the immune points. Once 12 or more grains of moxa had been administered I re-palpated the stubborn immune region and found it has completely softened. On the back, treatment included needling the sacroiliac region, T-11 Huato bi-lateral & Du-2. Once the needles were removed and the patient moved around and tested out how she felt, she reported no pain on movement or on self-palpation of the sacrum/lower back. Treatment effect lasted two weeks with a slight regression by the end of the second week. Follow-up treatment consisted of similar acupuncture points as above with the addition of LI-15 with direct moxa. Reason being that LI-15 paired with KID-9 constitutes detox treatment (history of medications) which further ameliorated both the patients symptom and palpatory findings. Zu San Li ST-36 is by far one of the most well-known and utilised acupuncture points today. It is present in many acupuncture point protocols addressing a myriad of pathologies & the vast majority of acupuncture ‘styles’ seem to have a deep affinity for Zu San Li ST-36. It is interesting to note that the crown that adorns and resultant fame Zu San Li ST-36 possesses is not just a modern phenomenon, master acupuncturists and sages of times past such as Gao Wu placed this acupuncture point as one of his ‘4 command’ acupuncture points which has the particular function of regulating all disorders relating to the abdomen. Even the great Jin Dynasty physician Ma Dan-yang held ST-36 in high esteem & incorporated it as one of his eleven ‘heavenly star points’ which are a grouping of what he viewed as the most vital acupuncture points known. In more recent times there are countless acupuncture & moxibustion practitioners that advocate the importance of Zu San Li ST-36 in the treatment of a range of pathologies from diarrhoea, digestive issues, and knee pain to stroke prevention & even red eyes. I believe the vast array of seemingly unrelated symptomatic effectiveness attributed to Zu San Li lies in the notion that it is seen as the he-sea acupuncture point on the ‘earth’ meridian (stomach channel). As such, it can be utilised for rebellious qi or counter flow of qi, a concept that was first put forth in the acupuncture classic the Nan Ching. If we couple this concept with the trajectory of the stomach meridian originating at the facial region connecting the ventral trunk of the body and descending to the knee region & foot, we can imagine how when the flow of Qi within this expansive meridian is in a state of counter flow the above mentioned symptoms may arise. Basically, when the directional energetic flow of a meridian is traveling as it should be, harmony and ease are the result. The opposite is also true, thus when the directional flow of a meridian is travelling the wrong way (i.e. up instead of down) havoc and disorder manifest & symptoms may manifest on its trajectory. It is for this reason that many acupuncturists utilise the he-sea acupuncture point on the stomach meridian (Zu San Li ST-36) to ‘draw down the inversion of Qi’. ‘Down’ relating to the physiological energetic trajectory of the stomach meridian. One manner in which to do this is by applying direct moxibustion on St-36 Zu San Li. In the application of direct moxibustion you are essentially using the ‘small fire’ (okyu) to draw down the ‘big fire’ (manifesting as i.e. red eyes, high BP, blocked sinuses, insomnia…). Essentially, this is but one of many ways to correct the flow of Qi in the stomach meridian and the regions/systems of the body that it engages. Thus to recap, I believe that one of the possible reasons Zu San Li ST -36 is so ever popular in both the modern and classical practice of acupuncture & moxibustion is due to the stomach meridians expansive trajectory on the anterior aspect of the body and the regions and systems it engages, coupled with its powerful ability to regulate the counter flow of Qi (as it is a he-sea point). Now, to end this ramble & to give some imagery that will surely deepen our understanding of both the name and number. Zu San Li ST-36 is comprised of the character ‘Zu’ which shows the concept of ‘walking in meditation and balanced stillness’. ‘San’ is drawn as three horizontal lines and denotes the number three which is indicative of the heavens above, the earth below and human in the centre. Furthermore, it can highlight the descending ‘heavenly virtue’ received by the ‘earth’ which gives rise the ‘breaths’ or ‘life’. The character ‘Li’ in this context can be seen to represent a small community of farmers and their residences, but particularly the distance present between two of these farming villages. Thus, Zu San Li is also said to give one the energy and strength in times of need and to generate the capacity to travel three more ‘Li’. It is for this reason the acupuncturists of times past said ‘never travel with anyone who does not moxibustion Zu San Li”. As always, feel free to contact me with any questions you may have. Sawada style Taikyoku Therapy is a form of total body direct Moxabustion that promotes Qi & blood circulation throughout the whole organism. The purpose of this blog post is to present the main acupuncture points used in this form of Moxabustion & to observe why these acupuncture points were particularly chosen by the Master Moxabustionist, Ken Sawada. Baihui (DU 20) which is located at the vertex of the head & is referred to as the ‘hundred meeting’. Shen Zhu (DU 12) which is located on the back and interestingly enough Shen Zhu is considered to be related to the thymus gland. As such, it is customary in Japanese folk medicine to perform Moxabustion on each birthday a child has equivalent to the child’s age. For example, when the child turns eight years old he will receive eight Moxabustion cones at Shen Zhu (Du 12). It is thought that in performing Moxabustion in this manner the child’s immune system will be strong and disease will find no abode to reside. Other acupuncture points on the back used in the Taikyoku therapy include Ge Shu (BL 17), Gan Shu (BL 18) which is the back ‘shu’ acupuncture point of the Liver. Pi Shu (BL 20) which relates directly to the ‘earth’ element & is thus responsible for the digestive process as well as the transformation of food stuffs into a useable form of energy. Shen Shu (BL 23) & the acupuncture point level yet lateral to it, BL 52 Zhi Shi which translates to the ‘residence of the willpower’ & which is directly related to the energetics of the ‘Kidneys’ & their functional qualities as seen from a Chinese Medical framework. Lastly but certainly not least on the back, we come to Ciliao (BL 32) which lies over the second sacral foramen and is in a region of the body that contains an abundance of parasympathetic neurons (Rest & Digest). Moving on to the abdomen we find the middle guan or Zhong Wan (guan) Ren 12 as well as the ‘Sea of Qi’ Ren 6 (Qi Hai). The front ‘mu’ acupuncture point of the stomach and the ‘sea of qi’ respectively, are essential pivotal acupuncture & Moxabustion points used to ameliorate a myriad of disharmonies and conditions. On the upper limbs we find direct Moxabustion administered on Quchi (Li 11), which according to Master Acupuncturist Kiyoshi Nagano is directly related to the immune function of the individual & thus direct Moxabustion performed on this region can regulate ‘immune’ related conditions. SJ 4 (Yangchi) or ‘Yang pool’ is also used and this acupuncture point has a direct link to ‘yuan Qi’ or original Qi. On the lower limb we find that acupuncture points used include Zu San Li (ST 36) & Kid 6 (Zhaohai). Both these acupuncture points are fortifying to their respective organs and I can say that along with Quchi (LI 11) they are both a staple in my own personal self-Moxabustion practice. Thus above we can see the acupuncture points chosen by Ken Sawada for the direct application of (okyu) direct Moxabustion in Taikyoku therapy. From an acupuncture point actions/indications framework we can see and hypothesise why these acupuncture points were chosen for a form of Moxabustion therapy named ‘whole body’ therapy. However, even from a structural perspective the regions choses relate to the spine, top of the head & the major joint of the limbs. Thus, engaging these vital regions with Moxabustion creates movement and flow in said regions were circulation can tend to stagnate (i.e. joints/articulation). The heat penetration & changes in blood chemistry induced by Moxabustion mixed with the strategic placement of said cones (okyu) on acupuncture points makes for a highly effective ‘full body’ therapy.